Gopal K. Agrawal is an established finance professional with WNS (Holdings) Limited, a multinational outsourcing firm having operations word-wide and listed at NYSE (NYSE:WNS). He is currently designated as Chief Internal Business Officer, reporting into Group CEO, having responsibility of managing bottom-line. He has over 22+ years of experience in Finance & Accounts, Human Resources, Risk & Compliances, Cost containment and Business Strategy and Execution. His current interest is in promoting development of new and progressive business models in Travel and healthcare in India. He is also an independent financial advisor and a mentor/investor in early stage businesses. Gopal is a commerce graduate from GG University, Bilaspur, Chattisgarh. 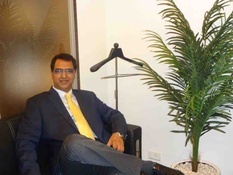 He is also a Fellow member of the Institute of Chartered Accountants of India and an Associate member of the Institute of Companies Secretaries of India.